automatically “posting” the completed procedure(s) in the patient ledger. Life-like tooth images help with case presentation and understanding by the patient. Color coding identifies Pre-Existing Conditions, Treatment Planning, and Completed Treatment, or any combination. The chart reads a child’s age in the database and suggests the appropriate dentition for children with corresponding tooth labels. Simple selection allows removal of “missing” teeth when not relevant. User-configurable button design allows for single-click entries of many common procedures for both pre-existing and treatment planning entries. Treatment plans should be clearly presented to the patient. BRS solves this challenge by combining a restorative chart and a treatment plan list on the same screen and including necessary financial information. Offer more than one option to patient, or organize by different phases of treatment. Treatment plan phases help with organization from the practice perspective, while enhancing patient understanding of options or expected sequence of completion. Link due dates to treatment plans items — indicate when the proposed treatment should be complete. 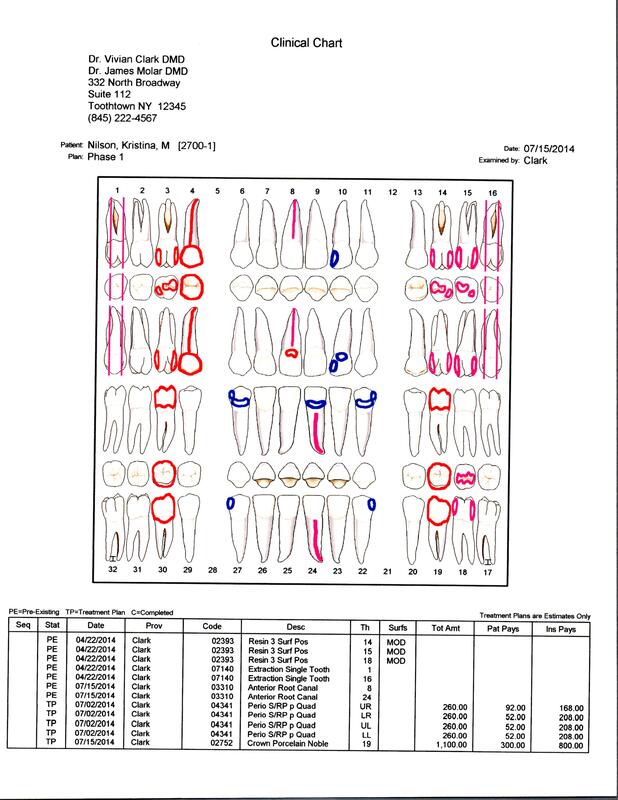 This dental charting software function is very valuable, as it integrates with the DOM Treatment Plan Report, and allows detailed listing of overdue, incomplete treatment. You can print the Charting Treatment Plan (optionally in color) for the patient to take with them when they leave the office. That includes user selection of graphic chart, treatment plan, and clinical notes. Sending home the treatment plan with the patient may enhance case acceptance. Clinical Charting includes the ability to enter and review Clinical Notes. Each client is able to set up and customize Clinical Note tabs (and associated colors) for easy organization of different categories of notes. Notes use Rich Text Format for maximum impact and understanding of content. Optionally, Clinical Notes may be dictated via voice recognition technology. Clinical Notes are “locked” at the end of each day to assure integrity of the “paperless” record. When a Pre-Treatment Estimate of the plan is needed for insurance submission, DOM’s dental charting software provides a one-click preparation of the Pre-Treatment estimate, enhancing office productivity. When the dentist marks a tooth image to indicate treatment completed, financial transactions automatically post to the patient ledger. Because we base our Perio Charting tools on our Clinical Charting facility, teeth and conditions entered in Clinical Charting carry over to Perio Charting. You get the same realistic tooth graphics for enhanced patient presentation.